The Commercial Kombucha industry continues to grow quickly. With an estimated $800M in sales for 2016, the category is showing consistent and steady growth year after year with good indicators that it will be around for a long time. Kombucha Kamp offers extensive experience assisting new entrepreneurs in getting started or in upgrading their current operation via consultation. From home brewers exploring a potential business opportunity to established Kombucha bottlers seeking to take it to the next level, we offer a full range of services that are tailored to fit your brand's needs. We offer a variety of ways to tackle issues to allow you, the brewer, to find the solution that fits with your ethos, style and company budget. Generally, we are best at helping you work through problems as well as helping you achieve your plans, so those with a strong concept of what they want to accomplish during the consultation will benefit the most. Alternatively, many people have used the consultation as a brainstorming session and, while we are not at liberty to discuss the particular techniques of any one company, our general knowledge of the Kombucha industry can help one clarify their vision as well. All consultations are 100% confidential. Additional commercial services available including HACCP plan, SSOP/GMPs, DNA Sequencing, Wholesale Culture & Starter liquid, and more! Invaluable resource for anybody looking to go commercial. Highly recommend Hannah & Kombucha Kamp's services. We were stuck in a tough spot with our business... well, many tough spots. We reached out to Hannah, and with compassion and a large body of knowledge on brewing techniques, troubleshooting and regulatory issues, she helped identify the core issues where we could not, recentered the focus of our business and brought perspective to the tangled mess we were facing. Since then we've been able to implement her suggestions to create a better product, target core needs and set up a stronger operational foundation for growth. Highly recommend this consultant if you're feeling stuck. We've realised how useful the consult has been, while trying to grow the business here. The market is definitely picking up, but there aren't too many believers at such an early stage for a commercial brand of kombucha like we're aspiring to become. We would like to thank Hannah and the Kombucha Kamp team for all their guidance in helping us start our company. We consulted with Hannah because we were aware that commercial brewing is very different from homebrewing. Hannah gave us the knowledge and confidence in knowing we were producing quality and safe JUN Kombucha at the most consistent and efficient way possible. We especially value the seemingly little tips and suggestions she threw here and there that made all the difference in our brewing. We would like to thank Kombucha Kamp for being our source of information. All of the tips and suggestions given throughout our consultation where vital for understanding the category, and ensuring the quality of our business. We really appreciate the work and efforts that you input on making this industry grow. From day one we had to search for knowledge and inspiration overseas, since kombucha still was unknown in Norway. We had no one here to ask or to learn from. We visited a few breweries in the USA and got enough knowledge to get started. But back in Norway when we wanted to expand, more questions came up. We were really lucky to find Kombucha Kamp, and to quick and easy get the answers to the question that no one here could give us the answer to. We are really grateful that we have them as a resource, and feel confident to get more help from them if more challenges should arise. They were great to work with and we would recommend their services any day of the week. Kombucha Kamp's consultation services are a tremendous resource for anyone in the industry, whether just starting out or already in business. Hannah's knowledge and expertise is unparalleled and she truly takes the time to understand you and your company on a very personal level. When we were just beginning to plan out our facility and process, we had so many questions about scaling up to commercial production and Hannah always made herself available for us whenever we needed her. She's the friendliest and most competent consultant we've had the good fortune of meeting and we can't thank her enough. Highly recommended! Hannah went over and beyond to give us the exact insight we were looking for our production methods and supply chain. We will continue to use her consultation services as we grow! Dear Hannah, we would like to thank you for your huge help during our phone session. When we started our company 'Kali Kombucha', over here in France, we faced a lot of unexpected challenges and decided to reach to you for guidance. It was really the best decision we made. All your suggestions were so helpful. Not only did you answer all our questions and gave us solutions to our problems, but you also gave us tips to improve our product and our process. Your expertise and knowledge allowed our company to move forward towards a higher production. Thank you again for your knowledge, and long life to Kombucha Kamp! The decision to partner with Hannah in the start-up and continued growth of Secret Garden Kombucha was, quite honestly, the best choice I made in my first year of business! Her step-by-step guidance and best practice insights, bolstered with recommendations on everything from how to set up a "kombucha nursery", to how to develop a HACCP that was approved by our local Board of Health on the first submission, to water sourcing considerations, charted the course for such a successful first year that I'm already looking for a larger fermentation facility to support our growing wholesale business! Thank you, Hannah, for literally writing the book on all things kombucha - and sharing your knowledge and passion with those of us who are called to be a part of this growing movement to heal the world, one gut at a time! Our consulting session with Hannah has paid for itself many times over. She helped us make informed decisions and avoid costly mistakes, so critical for a new business. We fully expect to continue working with Hannah as our business grows. As an expanding Kombucha company we found ourselves at a crossroads on how to effectively increase our brewing while maintaining a great tasting product. Working with Kombucha Kamp was awesome and got us on the right track. The team at Lupa's Kitchen strongly recommend Hannah to all sizes of brewing companies looking to maximize their current/future growth within the industry. Happy Brewing! After we moved locations to a much larger facility, we had issues with stuck fermentation and Kombucha Kamp was there to help. They provided us with a new starter culture that contained a different strain of yeast which solved the problem. We've been propagating the starter almost a year now without any further issues. Working with Hannah through her consultations has served as an invaluable asset to our business! We approached Hannah, knowing her as the CHAMPION she is for the Kombucha Industry through Kombucha Brewers International, and once we found out she offered consultations we couldn't wait to book one. We were in need of guidance in scaling our production while looking to make sure we didn't sacrifice quality in order to meet a rapidly growing demand. We were provided not only advise but tools that we could immediately and easily implement as well as resources we could refer to in the future as we continued to grow. Hannah's consultation aided us in areas of record keeping, batch scaling, and managing to have enough healthy starter on hand at all times...all being areas that have aided us in doubling our production volume effectively to now 2400 gallons since our consultations. Hannah's consults left us feeling prepared, excited and empowered to take on the next steps in growing our business and we would highly recommend anyone looking to grow a successful Kombucha business to consult with her! Hannah helped us over several hurdles we encountered while starting our company. She understands the vast array of challenges that affect brewers of all sizes. In addition to her expertise, she has been personally supportive and encouraging. She wants us to succeed! We will undoubtedly contact her again in the future as we grow. Hannah Crum of Kombucha Kamp has, and will continue to be an invaluable resource and partner to us. 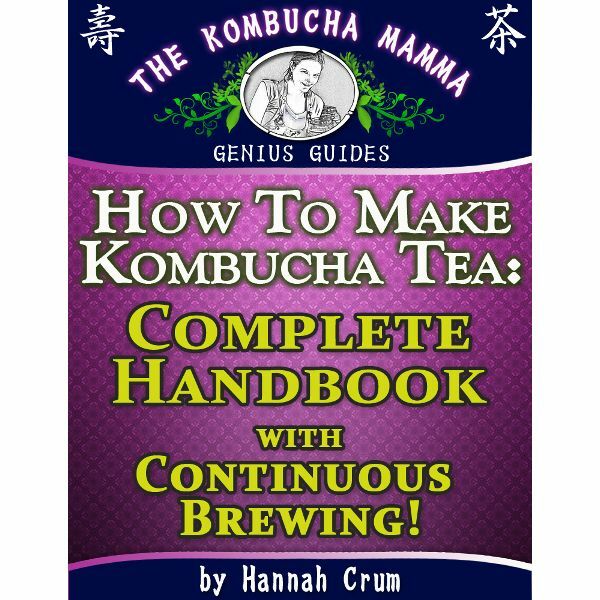 We started home-brewing with Kombucha Kamp SCOBY's, vessels and teas which are of the highest quality and flavor- and as we looked to make kombucha our business Hannah was our first call to help with our next steps. Hannah has helped us with brewing techniques, scaling up, vendors, flavoring, bottling and has answered countless questions-always with the utmost knowledge and professionalism. Sometimes after our consultation she will reach out to her many resources to get their input to our question and she promptly responds to us later with a well thought out answer. Her passion for kombucha and the positive impact that it can have on people's lives (and in the people's lives of those who are making it for others) is inspiring and we feel fortunate to know her and have access to insights. After a few years of brewing and selling kombucha, we still had many questions about the long term sustainability and scalability of our processes and we were still experiencing inconsistencies with some of our brews. We, of course, wanted to make sure our yeasts and bacteria were happy and healthy for now and in the future. We decided to give consulting with Kombucha Kamp a try and quickly into our consulting session Hannah had answered many of our questions and had given us some very straight forward tips and techniques for maintaining the health of our kombucha and SCOBY's. Since our consulting session our brews have been extremely consistent. Kombucha Kamp's consulting advice and insights into the industry gave us the confidence we needed to begin expanding our operation. We highly recommend working with Hannah! Dear Hannah, We would like to thank you so much for your help and guidance on setting up our Kombucha Brewery over here in the UK. Your knowledge is unsurpassed and you have given us a great start with information that would have taken us years to get right through trial and error on our own. We are grateful that you took the time and effort to explain the intricacies and finer details of larger scale brewing and we have now begun on the road to turn our hobby into a business. Whilst we have only just started out, we would not have gotten this far without your help and we feel that you went the ‘extra mile’ to help us through our initial consultation and no doubt we will have further consultations with you as we progress, which we are looking forward to. It is good to know that you ‘have our back’ and we truly appreciate the fact that we can reach out to you if we have any problems. Setting up in business is usually like a minefield and especially so over here in the UK where Kombucha is still relatively unknown. But, you have given us the confidence press ahead and we are very much looking forward to the future. If anyone is considering setting up brewing on a commercial or larger scale operation, We would not hesitate to recommend you with confidence and without hesitation. Through my world travels I have been fortunate to have met many fermented food gurus. We at Kombucha 221bc love Hannah and Kombucha Kamp! I have discussed a variety of topics about kombucha with Hannah. She has been instrumental in our company's growth. Hannah's expertise comes from a deep understanding and feeling for the magic of kombucha culture (SCOBY). Her resolutions to challenges come from a broader perspective which then offers a streamlined solution to a potentially complex subject. I would recommend Hannah to anyone interested in kombucha regardless of their productions scale. Kombucha Kamp's consultation was extremely helpful. Their vast experience and knowledge allowed them to focus in on our issues like a laser guided missile. Their recommendations and advice helped us see tangible results quickly and lead to practices we use with every batch to this day which equals money well spent. We are grateful we had them as a resource, they were awesome to work with and we would recommend their services any day of the week. Making kombucha is a combination of craft, art, science, and joy. My friends at Kombucha Kamp have mastered all aspects. We've always been proud to say that our original SCOBYs came from Kombucha Kamp. Why? They are simply the healthiest and most robust cultures we could find, and they still are. As important is the taste. Kombucha Kamp SCOBYs produce a solid, robust flavor profile that gets to the heart of what real kombucha is all about. As our business has grown, Hannah and Alex have been there for advice and support. They are unwilling to compromise their ideals for any reason, and they continually strive to learn, improve, and educate. I truly give Kombucha Kamp my highest recommendation. Being from the Midwest there are few places to turn to for answers. Kombucha Kamp provided me with that in a new and growing market. Hannah's advice and knowledge of the industrial kombucha world was refreshing as our small brewery grew. She was able to give us multiple options on how our brew was best able to move forward for a higher level of production. Her knowledge extends beyond the business and deeply into the science of symbiosis. Cheers to your health and Kombucha Kamp! Kombucha Kamp's consultation was really helpful to us as we grew and worked through issues. They had a lot of experience and knowledge to draw from and we saw tangible results from implementing their recommendations for our larger batches. We are really grateful that we had them as a resource, they were great to work with and we would recommend their services any day of the week. Kombucha Kamp's consultation was really helpful to us as we grew and worked though issues. They had a lot of experience and knowledge to draw from and we saw tangible results from implementing their recommendations. They also connected us with labs and other resources in the industry that we still use today. We are really grateful that we had them as a resource, they were great to work with and we would recommend their services any day of the week. Kombucha Kamp has supported the rapid growth of our business from the very beginning. In fact, Hannah was one of the first kombucha experts we spoke to before launching our brand, Remedy Kombucha. With Hannah's expertise, we were able to confidently build a sustainable business using the invaluable knowledge base that she has acquired over the years. We know that Hannah is only a phone call away if we have any questions that need answering quickly, and her warm nature makes it all the more enjoyable. We've built a a beautiful working partnership with Hannah, one we will cherish for the life of Remedy and beyond. As one of the few kombucha bars in the country, there isn't a blueprint out there and there are not a lot of resources available to help. We were lucky to find Hannah and be able to utilize her expertise. As you can image we had a huge list of questions for her and some crazy ideas we had been kicking around. She thoughtfully answered every question and concern. She also provided great feedback about the ideas we were cooking up. Her consultations saved us countless hours, money and frustration. I am super thankful to have found her. I highly recommend that anyone who is thinking about getting into this business find a consultant you can rely on whether it is Hannah or another helpful expert. We would like to thank Kombucha Kamp for being our source of inspiration. All of the tips and suggestions given throughout our consultation where vital for improving our brewing process and ensuring the quality of our business. We really appreciate the work and efforts that you input on making this industry grow. We would like to thank Hannah Crum (Kombucha Kamp) for being our source of inspiration, all the tips & suggestions given throughout our Consultation where vital for improving our brewing process and ensuring the quality of our TAO Kombucha, we really appreciate the work & efforts that you input on making this industry grow. We will be forever grateful!! We would like to thank Kombucha Kamp for being our source of inspiration. All of the tips and suggestions given throughout our consultation where vital for improving our brewing process and ensuring the quality and safety of our booch. We really appreciate the work and efforts that you input on making this industry grow and to help develop the best booch brewers on the planet! Kombucha Kamp's consultation was very helpful to us as we grew and worked through issues. All the tips and suggestions given throughout our consultation were very helpful. Thank you for all that you do, Kombucha Kamp! Hannah and her role at Kombucha Kamp has helped the Wild Tea Kombucha family tremendously. From the onset of the business, Hannah helped us grow, answer key questions, and provided a mentorship that was invaluable. From basic questions about temperature and sugar ratios, to more indepth questions regarding government legislation- Hannah has been transparent & made the information readily available. She may only be one woman, but she still takes the time to respond to everyone who writes her. Her kindness is genuine, and her passion about kombucha is unlike any other. Attending Kombucha Kon 2016 was a positive entrepreneurial collaboration of like minded people who care about health and creating options for consumers. We were so fortunate to the vendors that attended, teaching us about the latest technologies available. The kombucha bar was my favourite! Next year... more kombucha! I've had 2 consultations with Hannah at Kombucha Kamp and they were worth every cent . I had no idea what I was doing and needed answers. The first consult was incredibly grounding. There were major questions answered that I don't feel I could have figured out on my own. She was direct, very knowledgeable, and the session was super efficient. I'm still very new in the game, but have much more confidence about moving forward. Definitely see myself checking in for more consultations in the future. Also, The Big Book of Kombucha is a wonderful guide and resource! Buy it! Much appreciation and gratitude for this service being available! Hannah Crum from Kombucha Kamp was extremely instrumental in mentoring us with getting our brews into production on a large scale. Many challenges were in front of our brew team and we had no instruction manual, so I reached out to Hannah for guidance on how to keep our batches consistent and our Scoby's healthy. I respected that Hannah relied on her own in depth understanding of the brewing process and never shared the secrets of other commercial brewers she worked with. With her help, we were able to launch our brand with confidence, knowing our end product was as good as it could be. Bravo to Kombucha Kamp for helping the industry leaps and bounds!